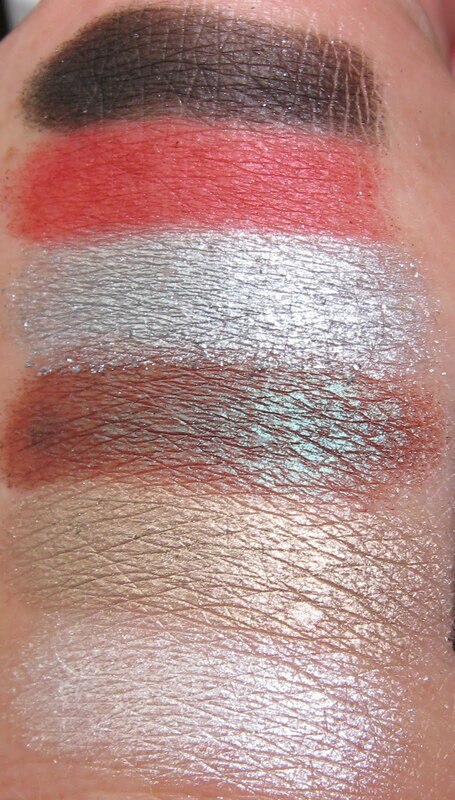 Wet n Wild has once again come out with some fabulous LE Holiday eye shadow palettes, and at $4.99 each (1/2 off at Walgreens through tonight), you need to hunt these down if you haven't already! There are 4 palettes in this offering, which you can view here. In my opinion, Night Elf is probably the most unique one, primarily because of the ever-so-slightly coral tinted red shade, and the earthy reddish brown shade with a turquoise flash (lower left). These don't have specific color names, but they are all highly pigmented, build up nicely, are inexpensive but very good quality, and in a word...lovely! Below: Swatches are shown both with an Ott lamp (directly below) and in natural lighting (second photo). If that brown/teal shade was a nail polish, it would be Cover Girl Chocolate Mint! The top 2 shades (black and red) are not as foil-like as the other 4 shades. The top (black) shade has tiny multi colored glitter in purple, blue and gold, but it's quite subtle. Below: The palettes all come with a different eyeliner pencil that coordinates to the shades in the palette. Night Elf includes a black pencil with what appears to be the same tiny glitter colors as the black eye shadow shade. This is similar to my MAC Greasepaint stick in French Quarter. Certainly not a dupe, but they do remind me of each other. 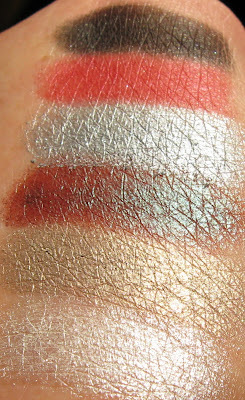 My Greasepaint stick is a shinier black and is a little creamier, but the WnW offers a nice alternative. Wet n Wild is one of my favorite drug store brands for both nails and cosmetics. Their eye shadow palettes are never disappointing, and they not only provide me with some very cool shades at very inexpensive prices, but they also provide me with a frenzied challenge every time they release their LE ones! I hunt and hunt to no avail, and thankfully, I'm almost always able to finally locate them. There seems to be just a very small window of opportunity to find these because they are LE. So even though they don't cost much, they provide hours of stress, hunting, driving, thinking about where to look next, and of course they're a nice wearable product for your cosmetics collection. I definitely think they give me my money's worth, and then some! Have you been able to find these yet? If you have, let us know what you picked up and your thoughts on them. I agree, that color is eye-catching, but I think it's hard to pull it off! I'm such a sucker for colors like these, I buy them and then i end up looking horrible with them on so I stick to purples, greens, blues and nudes, of course! I snagged 2 palettes up right away. Then came back later for another. Then I had to get the last one to complete the set. That one did take some time to find. Then, I found a display with one of each. So I got those as gifts. Night Elf was certainly the first one I got! I've only just tried WetnWild a few months ago. There was a gift set in a clear train case. It had 2 palettes, 2 small nail polishes, 2 small lipsticks, mascara, eye pencil and blush. Everything was on the smaller size. I was suprised at how pigmented they were. The only thing I didn't like was the cheap packaging. I guess it was just for this set. Is their regular packaging harder plastic? The awful cheap cases was what turned me off. I haven't bought anything since. 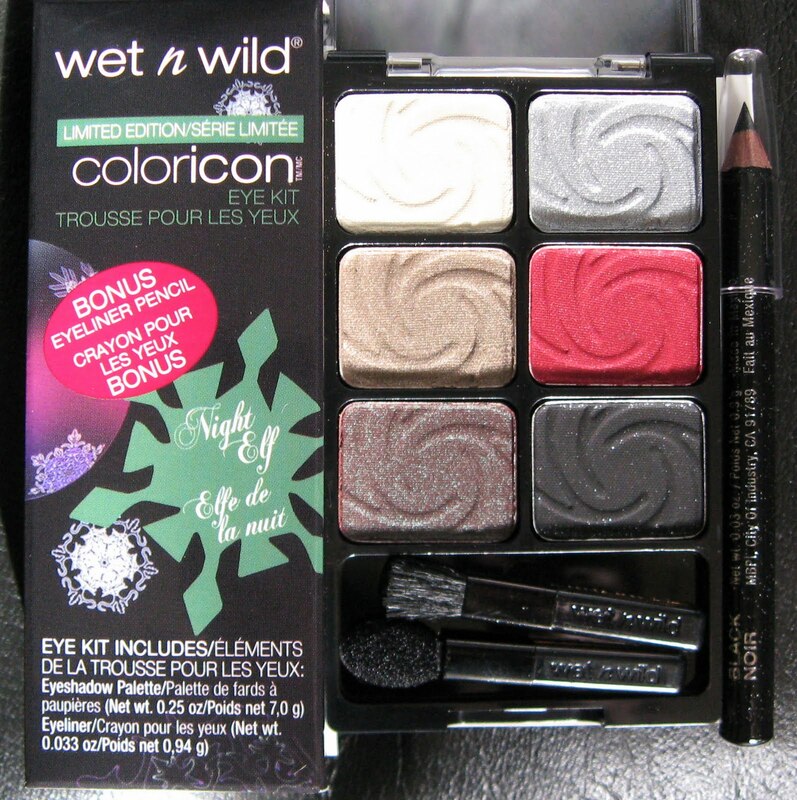 uh, we have wet n wild here in Italy too, they're quite good from what I can see, i must definitively try something !